You can take a better look after the break! There's no word yet on when, where and how you will be able to obtain these, but we will keep you posted. It seems likely that Finn will be used for promoting a video game as a code is included on the packaging (similar to 5004081 Plastic Man), although I am not aware of any LEGO Star Wars video games being released in the near future. What do you think? I'm really digging the first one. Thanks to Dubla Ubla for the news. Looks like a nice and (hopefully) cheap way to get Finn and yet another excellent microbuild. Thumbs up from me. I was just looking at the red armed C-3PO on ebay, my wallet!. The first one looks really amazing. To be honest, I am surprised to see him come in Clone Suit form in a polybag rather than a set. Still really cool though. I could do with this being the May the 4th Promotion, much better than this year's. Is that a code I see in the corner of the first one, could it be for a new star wars TFA game? Finn has a code similar to Plastic Man and other bags before it. Could that mean there's a new Lego Star Wars video game in the works? I really hope so. Stop it, polybags. Stop. Just stop. Oh, I hope that at least ONE of these is available at Target over Christmas, because then there'll be no trouble finding one. X-Wing doesn't look at all accurate though. Bleh. @The_Box, I looked up Plastic Man, and he has the exact same style of code as Finn (FN-2187). Oh, there's a spoiler for those trying to avoid any news on the film's storyline. I want the first one for sure (even more so if it includes a helmet as I want to add diversity to my Legion, or I could MOC a couple StormTroopers). ^^ Removed, but thought it was too obvious by now to be considered a spoiler. Finn has sand on his outfit, like the Tatooine stormtroopers. I love both polybags. I have the new C-3PO. I would love to trade for a TC-4 as long as the TC-4's protocol software is up to date. I wish I could comment on the matter of the code, but alas, I cannot. FInn looks great and I will do whatever it takes to get it, but Poe's X-Wing, not so much. If I can grab for a couple/few bucks, or better yet free with stuff I was already going to buy, then cool. Otherwise, they just cant seem to nail down the design yet. I don't get it. Isn't FN-2817 just Finn's stormtrooper identification number? 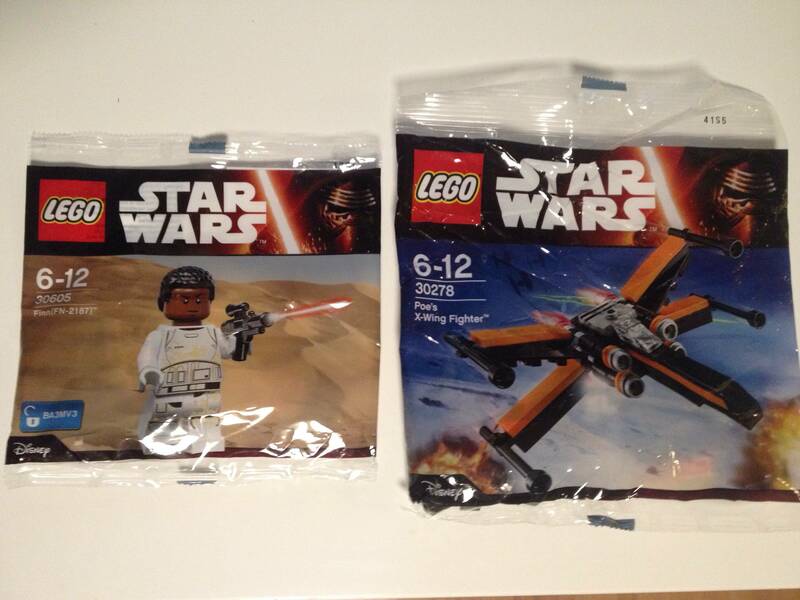 I won't be hunting down the X-Wing, as I'm no polybag collector, but I might try and get Finn. Heavy emphasis on the 'might', as I'm still saving for Constraction 2016. That x wing is great! Goes well with the tie fighter. Also, finn's armour has sand on it! Awesome! Well, that Finn polybag should save me about $85 to get that hairpiece. Single minifigures are usually in an opaque polybag of tougher quality, so it's weird that Finn is in a traditional one. I'm thinking he'll be super expensive for people who don't want to pay whatever $50 special it takes to get him, and then gradually come down in price. I waited about a year to get the Western Emmet from TLM, and easily found him for under $10 by waiting. I love that sandy stormtrooper suit, although I have no idea where I can find it. Chances are that the number on the Finn polybag is for unlocking something on the Lego Star Wars website similar to the Elrond minifig from 2012. I also wouldn't be surprised if you would be able to use that code to unlock Finn in the new Avengers Lego game, since both franchises are owned by Disney (similar to how Indian Jones made an appearance in the Complete Saga game). @Galactic Bricks, But, the only way LEGO has made polybags with codes on them are in a bundle with a video game, plus Elrond was an in-game code to unlock him early. I like them both, micro build looks cool! Finn is probably for May the 4th in the USA. @Chilly Productions While the Elrond code was used for to unlock in-game content, you could also take that code and unlock a special designer video on the Lego LotR website. I honestly can't see them putting out a new Star Wars game this soon with zero marking or any announcements for it. @Galactic Bricks, But still, it wouldn't be accessible for many people, making it a strange choice for an online game code. i am getting both. Do u think that the stomtrooper will replace the new c3po in some countries? I think it's safe to say that the "Code" is NOT for any video game. I can say no more, but think about TK-421, if you will. What we need is an easier way that we can get Polybags. I wish I could just drive over to target on any given day, pick up one of each. Drive home and tell my son he's been good all week and he deserved a small gift. But, I'll need to show up on a weekend (TRU) wait outside, fight some crazy mom that's last minute shopping, punch some dude that want 40 so he can sell them for $40 on Ebay, purchase $75-100 worth of LEGO (not so bad really) then be some mad about the whole think I can't even enjoy my kid and how he's excited when he gets a new set and how he loves the simple things in life..... No thanks I'm over the hunt for this crap, been burn many times! Is red arm C3PO really a wallet ouch? I saw a stack of like 20 in a TRU last week for USD $5 each. The X-Wing fighter is a Toys R Us consolation prize some building challenge. I only know because I got an email from them advertising it.